The Millersville community is cordially invited to the Millersville 250 Anniversary Grand Finale. Millersville is celebrating the special 250th anniversary of the town’s original land purchase. John Miller founded Millersville in 1761. Millersville was originally called Millersburg and was later name Millerstown before becoming Millersville in the 1800s. To celebrate 250 years of the community, The Millersville Historical Society, Millersville Lions Club and the Millersville Woman’s Club are sponsoring events that kicked off back in March and continue through the end of December. There have been a variety of activities and events that attracted all ages. Events included: art, music, dance, exhibits, parades, community celebrations, and so much more. The kick-off event took place in February. Dancing through the Decades, included dancing, food and beverages, an historical photo display, a fashion display from the two centuries, a special cake prepared by Carlo’s Bakery (aka TLC’s The Cake Boss of Hoboken NJ) and fireworks. In April, Millersville held an Exhibit Opening Reception. The public was invited to see bottles, furniture, oil paintings, garden equipment, WWII items, Boy Scout items, police badges, historical records, trolley items, cigar boxes, publications, postcards, ribbons, photos, clothing and business ads/marketing items. Summer events included a children’s ballet – Swan Pond held at Manor Middle in May. In June, Lancaster County Firemen’s Parade saluted the 100th Anniversary of the Millersville Fire Company. And in July the community celebrated the 50th Anniversary of Lions Club Pool. Come fall Millersville’s Got Talent competition started auditioning contestants. Along with the annual Millersville Parade. Beginning of November was round 1 of the Got Talent competition and the Finale was held 2 weeks later. Millersville students, faculty, staff, community members and residents competed for a grand prize of $500. Penn Manor senior Alicia Ygarza competed in the Got Talent competition. She sang “Fever” by the famous Elvis Presley. 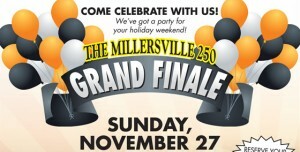 People who are interested can celebrate the Millersville 250 Anniversary Grand Finale on Nov. 27 starting at 2:00 pm. The event takes place at Turkey Hill Experience. 301 Linden Street, Columbia, PA. Admission for children ages 4 and under is free. Admission for everyone else varies. It is $4 for just cake and ice cream and $12 for the tour, cake and ice cream. This day they will be featuring Penn Manor’s Brass Quintet, balloon sculptures, tours and a photo booth (including a Turkey Hill cow backdrop). The closing presentation starts at 3:00 pm. 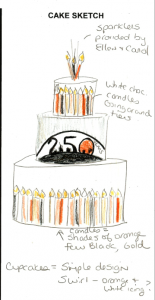 Following the presentation will be a special cake and ice cream. Also, stick around for the special unveiling of the Turkey Hill’s new ice cream flavor—the Swan Swirl, in honor the 250 anniversary. According to Pollock the ice cream is vanilla and contains fudge swirls, marshmallow bits and chocolate chips. “It was really good!” she said. Lets give it up to the first 250, and the next 250 years to come.